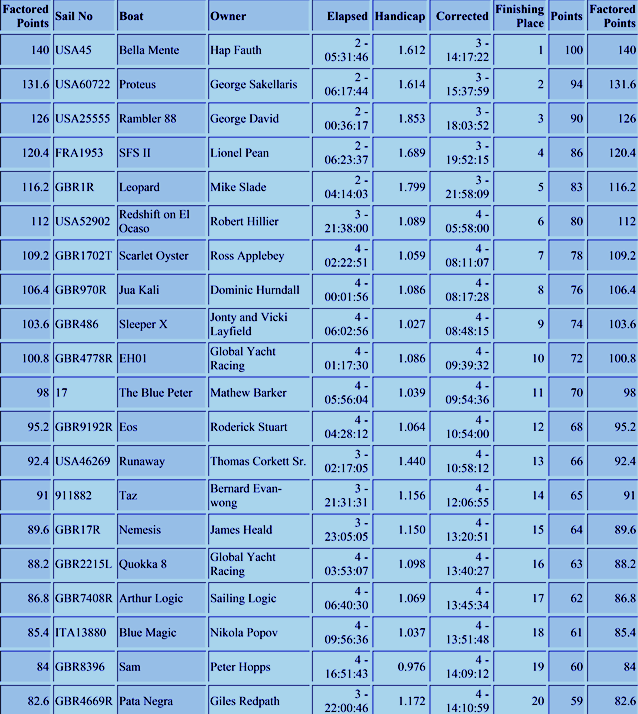 RORC Caribbean 600 | Start: Mon 20 Feb 17--all results here. From big names jumping ship to exciting new talent, the World Cup Series in Miami set the pace for a busy and exciting 2017 season. Francis Joyon and crew started their year by becoming the fastest crew around the world. Meanwhile, America’s Cup teams have started to reveal the new breed of machines they will be using come May. The World Sailing Show provides a monthly view of the racing world, from non-stop around the world racers, to Olympic campaigns; from seasoned professionals, to grass roots sailors, the joint initiative between TV producers Sunset+Vine and the sport’s governing body World Sailing (sailing.org) covers a wide range of racing activity around the world. The show also goes to 41 broadcasters around the world and is shown in 192 territories. Published Feb 22, 2017: 2017 will see Red Bull Sailing Team return to compete in the adrenaline-fuelled Stadium Racing circuit, spearheaded by Austrian superstars Roman Hagara and Hans Peter Steinacher. Published Feb 21, 2017: As we countdown to the 2017 Extreme Sailing Series™ season opener in Muscat, Oman, on 8 March 2017, take a look back at where we left off in the epic finale to the 2016 Series, the climax of a season-long battle between Oman Air and the 2016 champions, Alinghi. News Flash - Bella Mente wins 2017 RORC Caribbean 600. Bella Mente - Winner of the 2017 RORC Caribbean 600. Video above published Feb 23, 2017: From Portsmouth inception to her first flight in Bermuda on 11th February, the story behind LandRover BAR's R1 design, build, on the water testing and meticulous construction. MOD70 Nail-Biter--Multihull Line Honours for Phaedo3--While the multihull race record was not broken this year, Phaedo3 and Maserati had an incredible 600 mile high-speed duel. Lloyd Thornburg's MOD70, Phaedo3 finished the 2017 RORC Caribbean 600 on Tuesday 21 February 2017 at 21 hrs 20 mins 46 secs AST, taking Multihull Line Honours. George David's American Maxi, Rambler 88 finished the 2017 RORC Caribbean 600 on Wednesday 22 February 2017 at 11 hrs 56 mins 17 secs AST taking Monohull Line Honours. This year was George David's third line honours win in the RORC Caribbean 600. However, the record set by his previous boat, Rambler 100 in 2011 remains intact for another year. Bella Mente crossed the finish line just 14 minutes ahead of Proteus to set the bar for the RORC Caribbean 600 Trophy which will be awarded at the Prize Giving to the yacht scoring the best time under the IRC Rating Rule. Video above published Feb 17, 2017: Four-time Volvo Ocean Race veteran and two-time Olympic medallist Xabi Fernández has been announced as MAPFRE skipper for the Volvo Ocean Race 2017-18 edition. The Volvo Ocean Race 2017-18 will begin on Sunday, October 22, 2017, in Alicante, Spain, when the teams start 45,000 nautical miles of offshore racing over a course that takes in 11 landmark cities in five continents over eight months. Formerly known as the Whitbread Round the World Race when started in 1973, the Volvo Ocean Race is held every three years. Video above published Feb 16, 2017: With the deck of the new boat now firmly in place, The Boatyard's Nick Bice and Neil Cox visit the Persico Marine facility in Bergamo, Italy, to check out the progress on the eighth Volvo Ocean 65 in the fleet. World's largest sailing yacht impounded in Gibraltar | Business | TheGuardian.com: "Taller than Big Ben and longer than 13 London buses, billionaire Russian’s €400m luxury vessel kept in dock over unpaid bills to shipbuilder." Three rules are changed in sensible ways to promote safety, fairness and simplicity. Video above published Feb 20, 2017: With the Boatyard re-fit process well underway, the start line is getting ever closer – and the pressure on the team in the facility is growing. The Volvo Ocean Race 2017-18 will begin on Sunday, October 22, 2017, in Alicante, Spain, when the teams set out to complete a total of 45,000 nautical miles of offshore racing, over a course that takes in 11 landmark cities in five continents over eight months. Video above published Feb 29, 2016: 70 Boats from, 30 Different countries, 600 Nautical Miles, 11 Caribbean Islands--1 Amazing Race--The 2016 RORC Caribbean 600 started from Antigua on Monday 22nd February 2016. 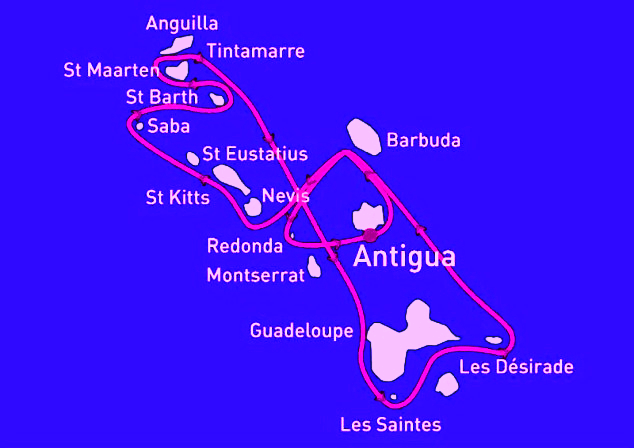 The 600nm course circumnavigates 11 Caribbean Islands starting from Fort Charlotte, English Harbour, Antigua and heads north as far as St Martin and south to Guadeloupe taking in Barbuda, Nevis, St Kitts, Saba and St Barth's, finishing back in Antigua. "The RORC Caribbean 600 is very different to the other 600 mile races and definitely not a holiday race in the Caribbean," commented RORC Racing Manager, Nick Elliott. "The race has many tactical legs with land effects and wind-driven currents which are both difficult to predict. The heat of the day and the long nights are also unusual features for an offshore race making it every bit as challenging as the Rolex Fastnet Race, and just as exciting. It is interesting to note that the records for the Rolex Fastnet Race and the RORC Caribbean 600 are very similar." Video above published Feb 13, 2017: As company co-founder Andraz Mihelin puts it, you get 80 percent of the fun of sailing a Mini with just 20 percent of the work. Seascapes have already inspired a new generation of go-fast barebones cruisers in Europe. We can only hope they will do the same on this side of the Atlantic. Video above published Feb 7, 2017: The catamaran Leopard 45/Sunsail 454 replaces Robertson & Caine’s successful Leopard 44 and can be configured for either three or four couples for use in either private ownership or charter mode. Video above published Feb 15, 2017: To mark 100 days to the start of the 35th America's Cup in Bermuda, here is a sneak peek of what the race village will look like come May 26, 2017. The village is located in the Royal Naval Dockyard on the westernmost end of the island, and will be the prime viewing location for the racing taking place on Bermuda's Great Sound. Video above published Feb 15, 2017: On Valentine's Day 2017 ORACLE TEAM USA launched the high performance yacht they will use to defend the America's Cup in Bermuda this summer. They become only the second team to do so, and the high performance yacht represents tens of thousands of hours of design and testing by the entire team. Guests gathered at the team's base in Dockyard, Bermuda for the big reveal and to listen to words from skipper Jimmy Spithill, General Manager Grant Simmer and Bermuda Premier Michael Dunkley. An extraordinary regatta! Quantum Key West Race Week opened the 2017 52 SUPER SERIES season. Next stop: Miami for the 52 SUPER SERIES Miami Royal Cup. Stay tuned. Racing starts again on 8th March. Video above published Jan 26, 2017, by 52SuperSeries.com. Video above published Jan 10, 2017: The Rolex Middle Sea Race set off on its 37th edition in 2016. Cannons fired from the bastions of Grand Harbour in Malta marked the start of this 608-nautical mile adventure. The action was intense from start to finish, as more than 100 yachts raced around Mediterranean islands over one of the most scenic sailing courses in the world. This 25-minute Rolex Spirit of Yachting documentary presents the action, highlights and memorable moments of the 2016 Rolex Middle Sea Race, from interviews with boat owners to magnificent racing footage and the awards ceremony where winners receive Rolex watches. DB Schenker is official logistics partner to EFG Sailing Arabia – The Tour for event organiser Oman Sail • Dutch Olympic sailing star Annemieke Bes to ..
Video above published Jan 21, 2017, by Alex Thomson Racing: Watch the highs and lows of Alex's fantastic Vendee Globe race. J96: Strong conditions for Eric Bellion on the way to Cape Finisterre. Vendée Globe video published Feb 10, 2017: Overview of the impressive sea conditions encountered by the skipper of CommeUnSeulHomme, currently in a storm on his way off Portugal heading to the finish at Les Sables d'Olonne, France. 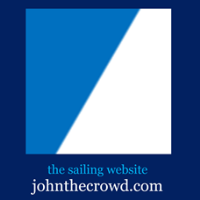 Continuing coverage of the Vendee Globe 2016-17, on JohnTheCrowd.com here. Live tracking here. Video above published Feb 10, 2017: Official Charity of one of the America's Cup teams. Land Rover BAR, the 1851 Trust has launched the Go Sail project 2017 for local schools. It will provide students living in the Solent area new experiences both on and off the water. Funded by Sport England, the project will include free sailing opportunities coupled with a STEM education programme at Land Rover BAR's Tech Deck and Education Centre. Video above published Feb 10, 2017: In this episode we meet Systems Engineer, Jonathan Nicols, Rescue Diver, Walker Potts, and see Anders Gustafsson in his element. An exclusive behind the scenes insight into what it takes to mount a challenge and compete in the 35th America's Cup. Follow Artemis Racing over 11 episodes in 2016 as the team prepares to win the oldest and most prestigious trophy in international sport. Video above published Feb 10, 2017: The Rolex Spirit of Yachting film featuring the 72nd Rolex Sydney Hobart Yacht Race is coming soon to the Rolex YouTube Yachting Channel. This 25-minute documentary will cover the action, highlights and memorable moments of one of the world’s most respected and revered offshore races. Witness this record-breaking race from behind the scenes, with exclusive footage of the yachts in action and interviews with the key players. Video above published Feb 3, 2017: Footage from Yachting World's test of the first production built offshore racer built around the Dynamic Stability System (DSS). The full report in Yachting World's March 2017 issue. Out in 25+ knots and massive waves with two 420's and a 470 off Sandringham Yacht Club... The result was a broken camera and some almost broken sailors. Enjoy the carnage and speed! Video above published Apr 24, 2015, @sailingshack on instagram, filmed & edited by Ben Hartnett. Video above published Feb 8, 2017: Warrior Sailing provides adaptive sailing instruction, equipment, and outreach for wounded, ill and injured service members and veterans. Using sailing as a platform, Warrior Sailing positively impacts the participant’s physical and mental health while reconnecting them with the camaraderie and teamwork previously found in military service. Video above published Feb 8, 2017, by Clipper Round the World Yacht Race: 57-year-old group manager assistant based in London, UK was a crew member on board LMAX Exchange, completing a circumnavigation. Video above published on Feb 6, 2017: Unique new footage of the 1934-built J Class Endeavour – both sailing and down below – after Yachting World's Toby Hodges had the chance to sail her in December 2016. Video above published Feb 5, 2017--Sailing with the Wynns--"Hope Town is the end of the Abacos for us, but why are we sailing NORTH? Get all the Details NOT in the video on our site: gonewiththewynns.com. Join our crew on Patreon and become a BIGGER part of the adventure: http://bit.ly/patreon-wynn. The holidays are approaching fast (yes, I know this video is a month behind real life) and we have family flying into Freeport on Grand Bahama Island. It's not exactly a desirable location to stay for a cruiser, so we're trying to make the best of our sailing adventure north. Our route has us backtracking up the Sea of Abaco and we're focused on finding new anchorages in the Out Islands. An underwater national park, some lobster hunting, deep sea fishing and of course sailing. Hope you enjoy." Sir Richard Branson: "Plastic pollution in the ocean is a major global problem"
Marine Debris Program | marinedebris.noaa.gov: "... The debris is continuously mixed by wind and wave action and widely dispersed both over huge surface areas and throughout the top portion of the water column. It is possible to sail through the “garbage patch” area and see very little or no debris on the water’s surface. It is also difficult to estimate the size of these “patches,” because the borders and content constantly change with ocean currents and winds. Regardless of the exact size, mass, and location of the “garbage patch,” manmade debris does not belong in our oceans and waterways and must be addressed ..."
Video above published Jan 23, 2017: Plastic in our oceans is killing marine wildlife at a staggering rate. Video above published Feb 4, 2017: ORACLE TEAM USA coach Philippe Presti, the man charged with helping the defending champions find each metre that the team hopes is going to add up a winning advantage when racing starts in May (see schedule further below). The Land Rover BAR team have been putting in the hours in Bermuda, training from sunrise to sunset. America’s Cup Match presented by Louis Vuitton: Bermuda BER 17-18th & 24-27th June 2017 America's Cup, June 2017 - AC35 in Bermuda: The America's Cup is without a doubt the most difficult trophy in sport to win. In the more than 150 years since the first race off England, only four nations have won the "oldest trophy in international sport." Video above published Jan 31, 2017: Good news, Spanish Volvo Ocean Race fans – MAPFRE will be back on the start line in 2017-18! The Volvo Ocean Race 2017-18 will begin on Sunday, October 22, 2017, in Alicante, Spain, when the teams set out to complete a total of 45,000 nautical miles of offshore racing, over a course that takes in 11 landmark cities in five continents over eight months. More info here. When others run from storms, Volvo Ocean Race sailors chase them! Here's a view of some of the most epic waves in Volvo Ocean Race history. Video above published Feb 1, 2017: The growing popularity of catamarans for bluewater sailing has spawned a number of designs aimed at sailors who want some speed along with their comfort, yet either don’t want or can’t afford to go down the high-tech carbon-fiber route. Video above published Jan 27, 2017: Are you ready for sailing or cruising in 2017? Here are ten top tips gathered from around the sailing world. Follow these steps to keep this sailing season a safe one--wherever in the world you sail or cruise. Captain John with 25+ years of experience shows you the no-nonsense cruising skills you need for safer sailing worldwide. Visit http://www.skippertips.com for more sailing and boating safety tips like these. Video above published Jan 31, 2017: Watch highlights from World Sailing’s 2017 World Cup Series Miami. Held in Coconut Grove, Miami, USA from 24-29 January 2017 the World Cup saw more than 400 sailors from 44 nations gather as the trail to Tokyo 2020 commenced. World Sailing's headquarters will relocate from Southampton to central London, UK in late summer 2017 | Sailing.org: "World Sailing's headquarters will relocate from Southampton to central London, UK in late summer 2017. The selection of London as the new home for the International Federation comes after an extensive evaluation process of possible locations undertaken since the election of a new President and Board of Directors in November 2016. The criteria for the evaluation included: International city Connectivity / ease of access for World Sailing members and stakeholders Ability to retain existing staff International diversity with a high quality, multilingual employment base World Sailing evaluated Southampton, Geneva, Lausanne, London, Winchester, Madrid, Barcelona and Valencia. Southampton, London, Barcelona and Valencia were shortlisted by World Sailing's Board of Directors in December 2016 before today's announcement of London." Yachts Miami Beach gets new look and layout for 2017 | BoatingIndustry.com: "... Bus shuttle service also runs all day between Yachts Miami Beach and the Miami International Boat Show on Virginia Key ..."